Once again the Health ranger is on the case, but we’ve been saying it for YEARS! Anyway – a snippet from his article here and I encourage you to READ it and act on it! We CAN provide you with a source of totally safe and effective products that take the guesswork out of what and how to buy safely! 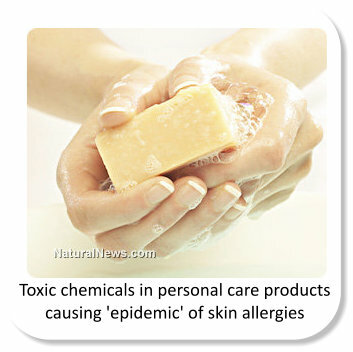 (NaturalNews) Be careful which facial creams, shampoos, moisturizing soaps and other personal care products you buy and use, as many of them apparently contain a chemical linked to causing what some experts have now dubbed an “epidemic” of skin allergies and other dermal issues. 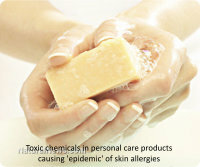 A new report compiled by dermatologists reveals how the preservative chemical methylisothiazolinone, or MI for short, has led to a massive increase in eczema and other skin allergies in recent years, and calls on regulators to ban the chemical. Long used in many conventional care products as a deterrent for bacteria and other harmful pathogens, and as an alternative to toxic parabens, MI is generally recognized by regulatory authorities in both the U.S. and Europe as safe and non-toxic. But its practical use in the real world tells a much different story, with many people reporting severe allergic and other negative reactions when exposed to it. The situation has gotten so out of control, according to reports, that some dermatologists are now calling for an immediate moratorium. In years past, MI was mixed with other preservatives, so its concentration was relatively low. But as these other chemicals were phased out due to their own tendencies to cause skin allergies, MI stuck around as an isolated chemical. According to the Telegraph, concentrations of MI in personal care products today are as high as 100 parts per million (ppm), up 2,500 percent from around 4 ppm in previous formulations. According to the Environmental Working Group (EWG), a consumer watchdog organization, MI is moderately hazardous, having been linked to various allergies and immune disorders. Studies identified by the group also link MI to brain cell damage, and the chemical has been implicated in causing nerve damage in humans.